Cooked a little bacon. And then some pancakes in the bacon grease. 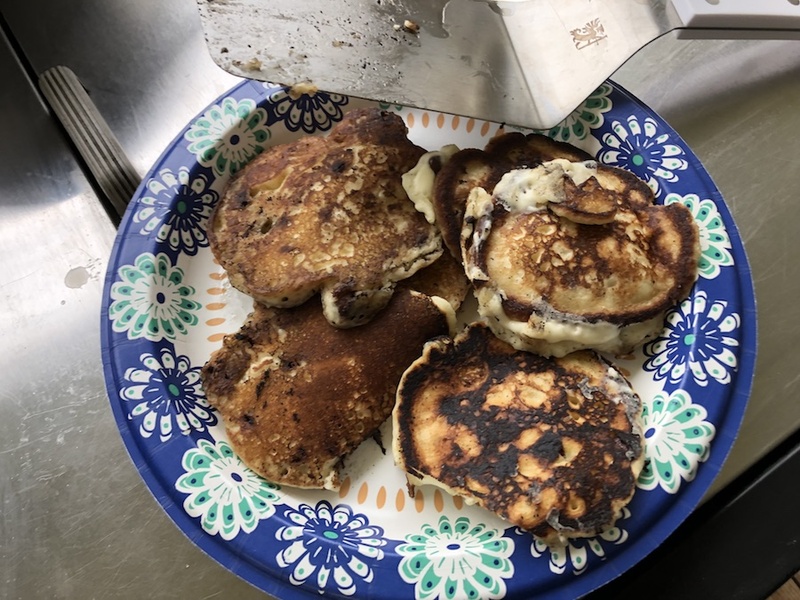 Well, not so much "in" the grease, but I did leave it in the griddle and tipped the griddle around every once in a while, as the grill isn't quite level. Had my temp good during the bacon cook, with a full chimney's worth in two charcoal baskets but with the bottom vent at 1/2 and the top vent at about 1/4. That was until all the constant lid lifting and pancake business. As the coals started to get too hot I also ran out of bacon grease. A last-minute effort with butter didn't help. So the first ones were great. The last ones were nearly burnt on the outside and undercooked on the inside. But a few seconds in the microwave made the last ones perfectly done! To the batter we added some semi-sweet chocolate chips. The bacon grease is what makes them look a little dirty. Cool! Never tried pancakes on the grill before! Smokey flavor, I take it? Those look good ! Iv done a breakfast skillet on the griddle . But pancakes is a hell of an idea . !!!!! 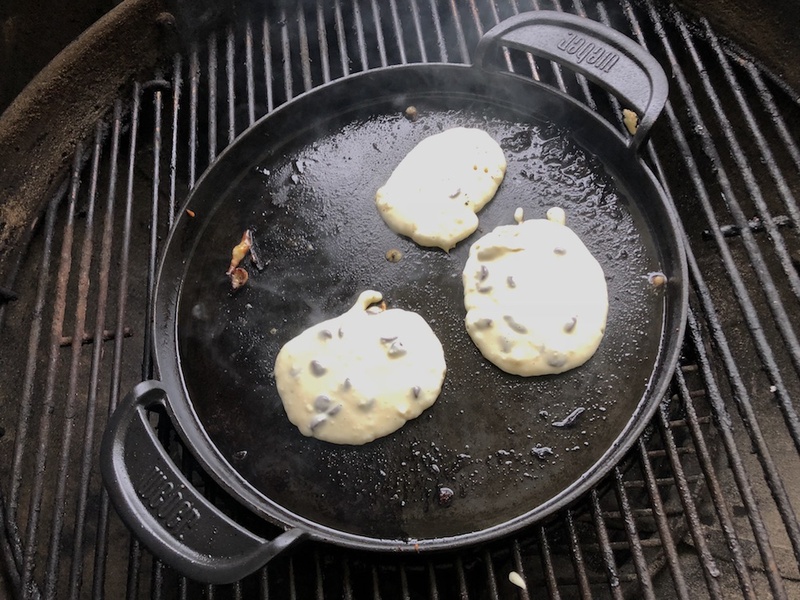 Pancakes on the grill is a good idea! I can confirm from experience. Not at all, unless you desire to add some wood for smoking. That's not something that interests me with baking ingredients. I used regular Kingsford, and only placed fully lit coals on. No smoke from that. And the unlit light up very slowly, as in when doing a snake, so also no start-up smoke there. In other words you can bake pies and cakes (I think) on a kettle and not freak out your guests with smoke flavor. ...But pancakes is a hell of an idea . !!!!! I've done it a couple times and tons of other people have of course done it over the years. My opinion is that this is why gas grills exist: consistent heat, and easy to knock down the heat if it gets out of hand. 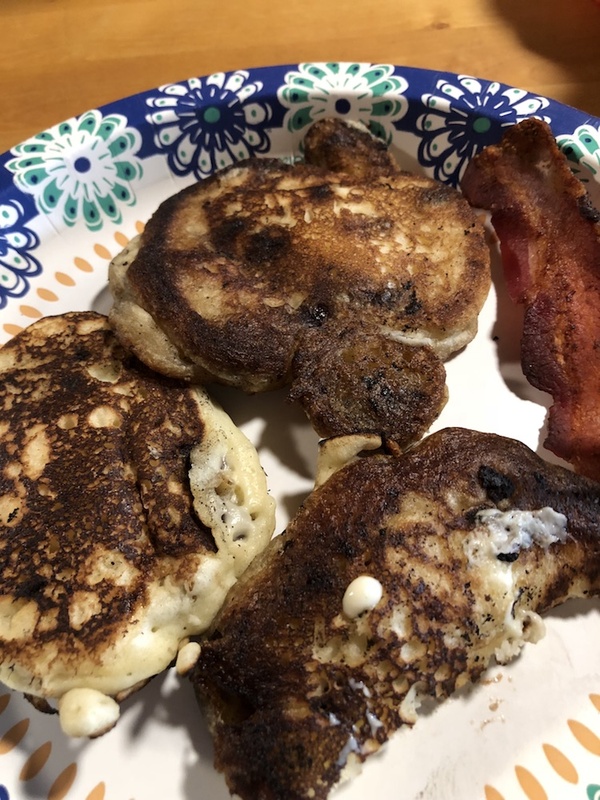 I don't really need the "romance" of charcoal-cooked pancakes. It's just way too short of a cook, and needs fairly low heat. That's harder to do with charcoal.